Katrina Craig and Alex Mavridis were in Berlin during the IHIF earlier this month and held a productive round of meetings and discussions with both owners, operators and investors. Amidst a backdrop of political, social and economic uncertainty, the sentiment from across the hospitality community was one of optimism. It was clear the mood is very positive for investment opportunities right now and Katrina noted that both established and new funds are looking to acquire and invest. Consolidation of brands in the industry is set to continue, giving brand houses the ability to appeal to new market segments. The recent purchase of Belmond by LVMH and the news that IHG have acquired Six Senses and that Hyatt are in the process of buying Two Roads is an exciting time, providing a fresh and new direction for brands. Further mergers and acquisitions are expected to be announced over the course of the next year and it will be interesting to see if these collaborations will be integrated or have parallel development teams as the big brands join forces. In today’s ever-changing world, new technology continues to transform customers’ experience expectations as well as the way in which they now they book. Lodging types are blurring: hotels, hostels, extended stay, serviced apartment, micro living and club concepts are becoming mainstream investments as Millennials and digital nomads redefine the work/life balance. Social media platforms are becoming increasingly influential booking channels with the ability to book hotels directly from posts on social media platforms – investment in all aspects of technology is booming. 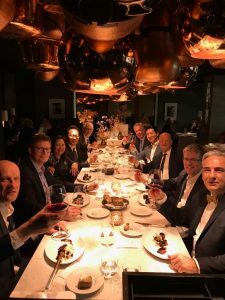 Katrina also co-hosted a private dinner with Eric Rosedale of Greenberg Traurig Law at 5 Cinco on Tuesday 5th March – a lively mix of prominent investors, developers and operators over excellent food and drink.